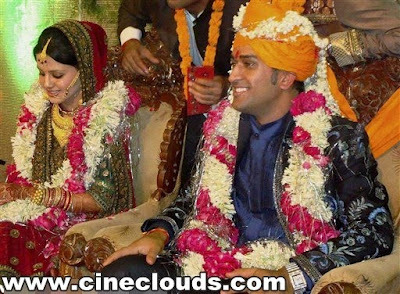 Dhoni marriage photos and pictures are the most searched on the net. Here are the exclusive stills for you. 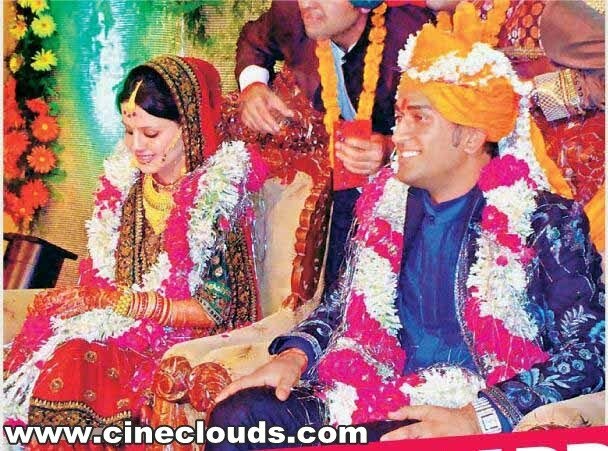 MS Dhoni and Sakshi Singh Rawat got engaged at Hotel Competant in Dehradun on Saturday and their marraige took place the next day at Vishranti Resort, near Dehradun. 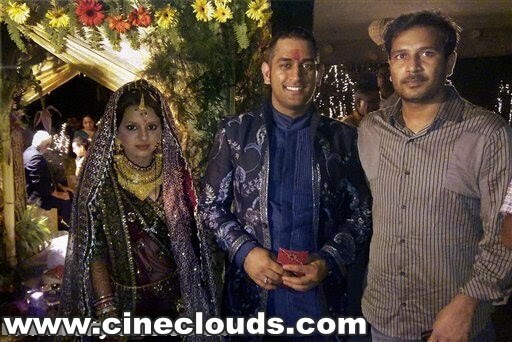 Vishranti Resort is owned by Raje and many high profile guests attended Dhoni's marriage. 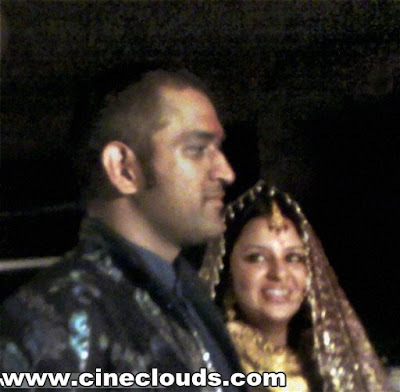 Sakshi, a hotel management graduate and Dhoni had been knowing each other since their school days. 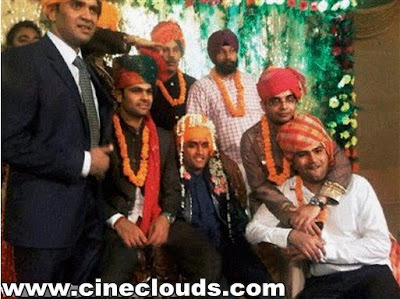 Their fathers also worked together in Ranchi and both the families were quite close since then. Dhoni's wedding was attended by high profile guests like ICC chief Sharad Pawar, BCCI President Shashank Manohar, former Rajasthan Chief Minister Vasundhara Raje, Actor John Abraham, Director Farah Khan and cricketers R.P.Singh, Harbhajan Singh, Ashish Nehra and Suresh Raina. Dhoni’s father had moved into the resort on Saturday morning. John arrived on Sunday afternoon, as did Sakshi and her parents ( who had earlier in the day attended a puja at the home of the bride’s cousin, Abhilasha Bisht). They were followed by Dhoni’s close friend and Chennai Super Kings teammate, Suresh Raina. Giving Sakshi company was her schooldays friend Bhavna Oberoi and three of her classmates from the hotel management school in Aurangabad where she had pursued her hospitality course. The build- up to the marriage ceremony began early in the morning with traditional rituals such as Ganesh puja and singing of the mangal geet by the women. 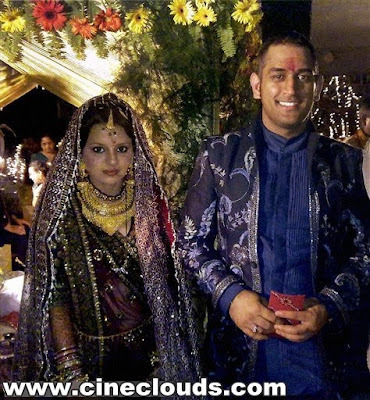 The rituals started with the pagdi ceremony, following which Dhoni, wearing a midnight blue sherwani, mounted the white ghodi outside his cottage. It took the wedding party about 10 minutes to reach the banquet hall, which was 400 metres away from his suite. Once there, Dhoni dismounted for the milni (formal introductions) and exchange of shagun envelopes between the families. John, whose long- time companion of Bipasha Basu played Cupid to Team India Captain and Sakshi Rawat, danced non- stop to the disco and bhangra numbers that rocked the post- nuptials party, which stretched till 5 in the morning on Monday. The bride, who looked resplendent in her crimson lehenga , wore minimal makeup and her choice of jewellery was confined to dainty, trendy trinkets. The men in the wedding party wore embroidered kurtas and pagris , and the women stuck to mostly pink saris. The exceptions were John, who paired his kurta with cool blue jeans, and Raina, who sported a sherwani. 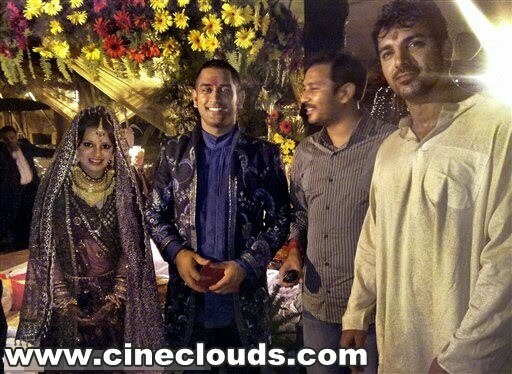 Sharp at 8, Dhoni entered the hall for the jaimal ; the bride followed half an hour later. The jaimal was a sight to reckon with as both bride and groom were lifted high above by their friends and the two played hard- to- get before actually exchanging the garlands. Sakshi’s family, which belongs to Dehradun, hosted the dinner with a lavish spread of about 50 dishes, from dal makhni and macaroni to paneer tikka and chicken manchurian, and an array of ice- creams, cakes and puddings ( which neighbouring Mussoorie is famous for) and mocktails. The wedding party, in fact, had spent the entire day digging good food. For breakfast, they had poha masala , idli sambar , methi thepla and aloo bonda with eggs, juices and hot chocolate. And the spread for lunch included butter chicken, mutton curry, yellow dal , malai kofta , baigan achari , ice- cream and gulab jamun . More than 100 poilcemen were posted at the gates of Vishranti Resort to ensure that only cars whose numbers were already given were allowed to enter.